Do you want to be free from Maculopathy? 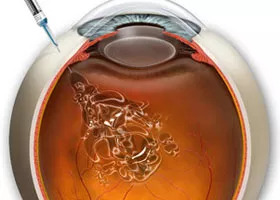 A new drug based on Ocriplasmina has been approved in Europe for vitreous macular traction maculopathy’s cure and macular hole. Nowadays, to cure macular hole only one intravitreal injection is enough. In the past, the only solution was surgery: vitrectomy. The main studies published on New England Journal of Medicine demonstrated that in the 40,6% of patients cured with Ocriplasmina, macular hole was closed before the 28th day (VS the 10,6% of patients cured with placebo). The new drug for maculopathy’s cure, based on Ocriplasmina, dissolves protein fibers that are responsible of anomalous traction between vitreous and macula. In this way, Jetrea® disjoins vitreous and macula, removing vitreomacular traction and helping to close macular hole. Since 1/14/2013 Ocriplasmina is used in USA and now is finally approved in Europe to cure vitreous macular traction maculopathy and macular hole. Contact us to discover if this new maculopathy treatment Ocriplasmina is for you.